20kg Baggage allowance to be checked in. All airport & local taxesFull religious programme organised by Marian Pilgrimages with a complete programme of sightseeing and visits to sites of interest. Check in at Dublin airport for you Ryanair flight departing at 19.00 for Malta arriving at 23.40. Coach transfer to the 4 Solana Hotel Resort & Spa in Mellieha for 7 nights on a half board basis. This morning will we depart for Mass at the Church of the Bonfire(St. Paul�s shipwreck Church) in St. Pauls bay. Morning tour of Saint Paul�s Bay and the church of the Bonfire. Saint Paul�s Bay is a town in the Northern Region of Malta. It is situated sixteen kilometres northwest of the capital city of Valletta. Saint Paul�s Bay is largest town in the Northern Region and the seat of the Northern Regional Committee. The Village�s name refers to Saint Paul�s Shipwreck, he was shipwrecked as a captive en route to Rome in AD 60. According to the Bible, he was shipwrecked on an island while travelling from Caesarea to Rome and it is believed that this island was Malta. Saint Paul is believed to have introduced Christianity to the Maltese. Afternoon return to hotel. Dinner in the hotel and over night. Morning departure to Mass in rotondo of Mosta church, to see where the miracle of Mosta happened. In the steps of St. Paul, morning drive in mellieha, introduction to this beautiful resort with the largest sandy beach in Malta. Visit the Parish church, the church of Our Lady�s Grotto and the Air raid shelter. 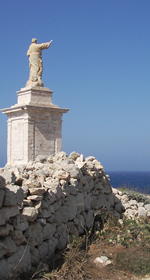 Afternoon excursion to see St. Agatha�s Tower, Popeye village, and visit the Mellieha sanctuary with its famous painting by St. Luke who was shipwrecked here with St. Paul. Return to hotel for dinner and overnight. Morning departure for mass in Mdina. In the steps of St. Paul, this morning we visit St. Paul�s Grotto - his first resting place on the island, and now part of the refurbished Wignacourt Museum. Visit Roman Domus, typical of the period when St. Paul was in Malta and one of the richest archaeological finds in Malta. Afternoon visit to Mdina, built on a plateau in the centre of the island. See the old Baroque buildings, the magnificient Bastion Walls, and visit the Cathedral and Museum. Return to hotel for dinner and overnight. Early morning departure for a day trip to Gozo and Mass at noon in Ta� pina Basilica. A short 25 minute ferry crossing takes us past the island of Comino and on the return you see the Blue Lagoon in the distance. On Gozo we visit the Basilica of the Blessed Virgin of Ta�Pinu, visit the Rotunda of St. John the Baptist, and see the natural limestone arch of the Azure Window. Visit the Citadel, Victoria - a Medieval City and Capital of gozo, enjoy a breathtaking view of the island from the Ramparts, and visit the 17th century Cathedral. Late afternoon return ferry to mainland Malta. Return to hotel for dinner and overnight. Morning departure to Shipwreck church in Valetta, where there are 2 important relics to be seen. 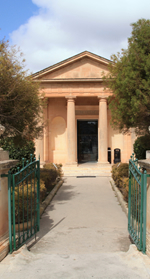 Then proceed around Valetta and visit St. Johns Co-Cathedral - home of Caraveggio�s masterpiece �the beheading of St. John�. Then proceed with a visit to Marsaxlokk, walk along the promenade and market place of this picturesque, serene and charming fishingvillage with colourful fishing crafts. the open air market takes place everyday. Afternoon visit to Hagar Qim and Mnajdra Megalithic Temple Complex. continue to the Blue Grotto and enjoy a short boat journey through the caves. this boat trip is OPTIONAL (not included, depending on weather and time). 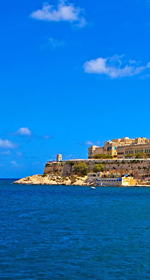 Mass in Maximillian Kolbe church and then have the day at leisure to enjoy the sites of Malta, the warm summer sunshine and maybe sample a few local cafes or restaurants. Back to the hotel for dinner. Depart hotel for mass in Balzan church on way to the Airport. After mass we will transfer to Malta Airport for our Ryanair flight to Dublin departing at 15.35 arriving in Dublin at 18.35.